Welcome to the 44th edition of the Hip Tranquil Chick podcast: a guide to life on and off the yoga mat. Produced from the Pink Palace in Washington, DC. Today’s podcast is an interview with Jill Abelson on spiritual activism, topped of with a pose of the podcast, hip tranquil chick suggestions, and fun podsafe music! View our shownotes at hiptranquilchick.com/blog. 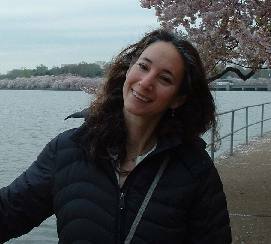 Jill Abelson, a certified Jivamukti Yoga Instructor, has taught yoga in the DC area since 1999, and is currently on the faculty of Flow Yoga Center in Logan Circle. She has trained with renowned teachers in the vinyasa, ashtanga, bikram, integral and kripalu traditions, with Jivamukti founders Sharon Gannon and David Life, and with many gifted teachers at Jivamukti's NYC headquarters. Jill is a long-time environmental advocate & communicator, and works both nationally and internationally on energy efficiency and global warming issues. She lives in Cleveland Park with her husband, Jeff, and German Shepherd, Rocky. Share your hip tranquil chickness with me, request show ideas, or pass along feedback by e-mailing me at kimberly@hiptranquilchick.com or leaving a love note in the comments section of hiptranquilchick.com/blog. A reminder that we’re on MySpace and Frappr, so please connect with the community virtually there, too! Have a burning question that you’d like hip and tranquil feedback on? E-mail me to have it featured and answered in our dear hip tranquil chick segment! View the summer edition of tranquiliT times: a quarterly museletter on all times hip and tranquil that you can sign up for at hiptranquilchick.com. Join me for my annual Fall Foliage Retreat in a rural setting in the heart of Virgina October 13-15. Save the date for our book launch fete on Thursday, November 16 in DC. Details to follow! I’m busily putting together all the step-by-step scoop to hosting a Hip Tranquil Chick Signature ChariTea Soiree with your fave gal pals when the book is released in November! Watch for this downloadable PDF coming soon with discussion tips, a toolkit, yoga sequences, recipes, and more! To host a Hip Tranquil Chick Signature Soiree in your area, please send your stats (name, location, e-mail) to kimberly@hiptranquilchick.com and you'll receive your Toolkit via e-mail shortly. To close out the show, we’re playing podsafe music---by new and independent artists who are sharing their music through podcasting from the Podsafe Music Network. Today’s selection is 8mm by DJ Eric Ill. You can learn more about DJ Eric Ill, including how to get more of his music, at his MySpace page. Thanks for joining me for the 44th edition of the Hip Tranquil Chick podcast. Namaste and let’s make a difference, girls! Thankyou so much for your podcasts! As there is not much hope of me participating in your class (I live in Australia) your podcasts are the next best thing! I have shared them with my yoga class here and we all thoroughly enjoy them. loved that podcast with jill. great practical advice on how to use yoga and reminder to be present always.